Motor/CID * Please let us know what motor you have. If you do not know, please call us at (208) 985-7650. Compression * Please let us know your compression. If you do not know, please call us at (208) 985-7650. Boost Desired * What boost are you looking to get? If you do not know, please call us at (208) 985-7650. Please let us know about your fuel delivery. If you do not know, please call us at (208) 985-7650. The wait is finally over! The Blower Shop is now in the LS market! 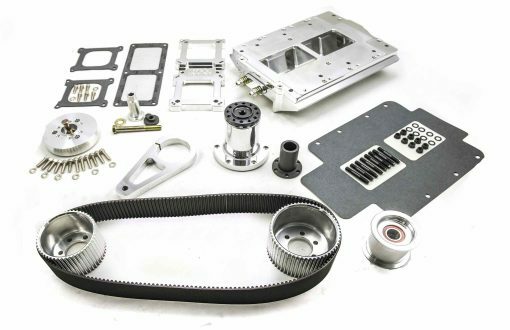 Upgrade that awesome Chevy Small Block with best all billet kit on the market. Now Available! With the amount of classic cars running LS platforms, the need for a manifold to that allows a supercharger was a necessity. Now with the ability to supercharge your LS engine with a 6-71, 8-71, 10-71 or 14-71. For most street use a 6-71 or 8-71 will provide better performance due to the engine size.